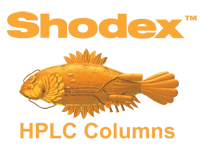 Shodex™ is a specialist for high-quality polymer-based columns with long life expectancy. This video provides a general overview of ion chromatography. In this video one of the most used separation modes - the reversed phase is being described. Shodex advanced HPLC columns has developed a reliable method for the analysis of polar organophosphate-based herbicides. Dr Christian Hirsch from Shodex has compiled a comprehensive HPLC column selection guide to help you select the right HPLC column for your application and achieve the best separation out of your HPLC measurements.